Lea Murphy joined LALIVE in 2018 as an associate, after completing an internship at the firm. Her main area of practice is international arbitration, including commercial and investment treaty arbitration. 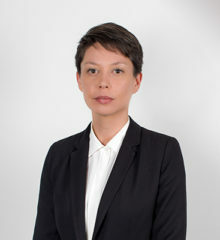 She has acted and advised in international arbitrations under SHIAC, CIETAC, and ICC rules. Before joining LALIVE, Lea Murphy worked as a legal consultant in Shanghai, China (2011-2016) and as a Senior Associate (2014-2016) in a legal consulting firm advising European clients on business and corporate law related to inbound investment. Lea Murphy holds an Italian Law degree from the University of Florence, an LL.M. in International Business Law from the National University of Singapore and East China University of Political Science and Law (2011) as well as an LL.M. from Cornell Law School (2017).